Rabbit anti Bovine, Canine, Human, Zebrafish ZNF485. The immunogen for anti-ZNF485 antibody: synthetic peptide directed towards the C terminal of human ZNF485. Synthetic peptide located within the following region: RHSSGLVEHQRLHTGEKPYKCNECGKAFPRSSALKQHKKIHNKERAMKCS. 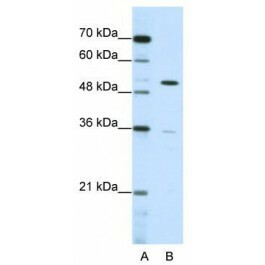 ZNF485 contains 1 KRAB domain and 11 C2H2-type zinc fingers. It belongs to the krueppel C2H2-type zinc-finger protein family and may be involved intranscriptiol regulation.